Dve simultánne pracujúce vysokorýchlostné kamery v samostatnom 90 stupňovom uhle vytvárajú najpresnejší 3 dimenzionálny snímací letový model golfovej loptičky. Viac ako 1 000 krát za sekundu vo vysokom rozlíšení snímajú kamery pohyb hráča a let golfovej loptičky. Širokouhlé objektívy kamier produkujú detailné zábery ktoré zaznamenávajú obrazy od kontaktu golfovej palice s loptičkou až po let golfovej loptičky po jej dopad na premietacie plátno. Extrémnu presnosť snímanie pohybu golfovej loptičky zabezpečuje vytvorenie modelu z 30 samostatných pozícií snímkovania. Let a trajektória golfovej loptičky je zaznamenávaná počas 3m letu k dopadovej ploche. Pohyb golfovej palice je snímkovaný 0,6m od odpaľovacej podložky až po jej záverečnú pohybovú fázu pri dokončení úderu. Snímanie letu golfovej loptičky v reálnom čase a snímanie pohybu golfovej palice v reálnom čase vytvára dokonalý zrkadlový obraz parametrov letu golfovej loptičky a švihovej sekvenciu golfového úderu. The overhead high speed camera tracks the ball from impact and alerts the software that the ball has been hit. At the same time it records the exact data relating to the horizontal launch angle, club speed, ball spin, swing path and face angle relative to the target line. This camera is also used for putting when the software is in putting mode. The data is sent at high speed via a USB2 interface to the computer’s enhanced host controller, enabling the software to instantly produce the 3 dimensional ball flight. The side high speed camera constantly tracks the golf ball from impact as it travels towards the screen. Accurately measuring the vertical launch angle, the ball speed and the ball spin to the point that all bad and good shots are registered producing the very highest of lob shots to the shots hit along the ground. In game play or practice, the choice of using a wedge or a seven iron from off the green illustrates this performance of producing the shots and trajectory you would expect to see. The ball speed is so accurately measured to produce the carry of the ball through the air. Again the data is sent to the computer through a high speed USB2 port connection using a 2nd host controller, so that the information is instantly analyzed and not affected by the data from the overhead camera. 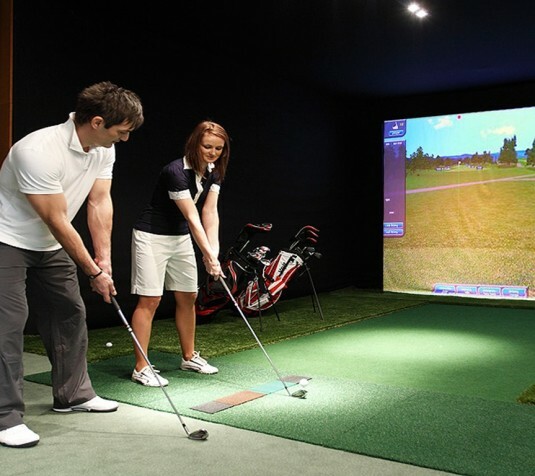 During development of the high speed camera system, many tour players, good amateurs and club golfers were used to test the playing of the simulator. 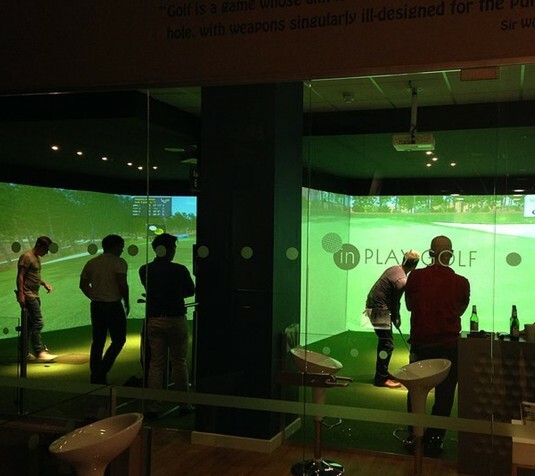 In all cases they were amazed at the accuracy of the system as each player re-produced shots on the simulator they did on the golf course. The hooks, slices and even the occasional shank was seen, if not liked. When it comes to chipping and putting then the system is way out in front of any simulator on the market. Playing from just off the green and using a range of clubs from 6 iron to lob wedge, the cameras will accurately detect the flight of the shot determining if run or back spin is generated. You will be amazed by the pin point precision of the shots produced which mirrors the shots played outdoors. Putting has now been developed to the same level of chipping. There is no delay in seeing the ball on the screen due to it having to travel a certain distance to be seen. If you have a putt of one foot or one meter as used on the US, European and Asian tours and is available for adjustment in the default settings. This setting enables you to make the greens as quick or as slow as you want while adjusting the green hardness at the same time. The 3D high speed camera system has been developed with the idea that it is maintenance free. Hitting from a standard type golf mat and with the cameras well out of the way then there is no reason why you shouldn’t get many years of use without the need to replace hardware or software, especially as software upgrades are free of charge. Sports Coach Systems policy to update the software for free on a regular basis is unique in the industry. You don’t lease the software, you purchase it with an agreement that Sports Coach Systems will provide updates. As the software and courses are updated then simulation play will become even more realistic. 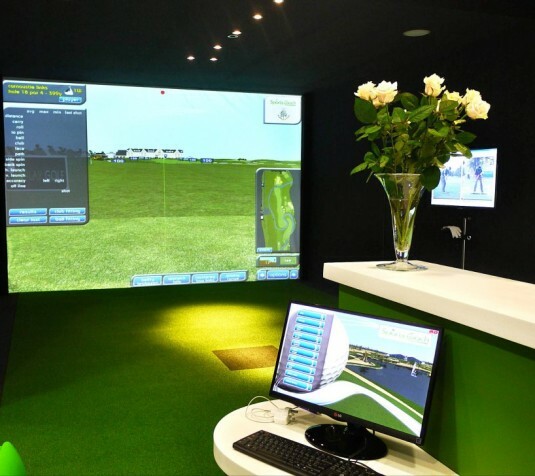 Sports Coach can even diagnose systems that are online, to ensure the highest level of service for clients, as well as the most accurate and reliable golf simulator in the world.